Wondering how to make the best use of plyometric boxes? Looking for a way to improve your power? Then you have come to the right place! Plyometric platforms have been used for years as an aid to development muscular power. However, in my experience, boxes are not always used correctly. In fact, if you have never been instructed in how to use plyometric boxes appropriately, you are more likely to injure yourself than you are of getting more powerful. How Should You Use Plyometric Boxes? The depth jump is probably the purest of all plyometric exercises. The idea behind this method of training is the utilization of the kinetic energy accumulated by the free falling body of the athlete during a drop from a specific and predetermined height. Due to its severity on the neuromuscular system, this method of training is only advised for elite level athletes with an extensive training history behind them. The jump looks simple but it is quite a complex exercise and as explained earlier, if the jump is performed incorrectly it will not only lessen the training effect of the exercise it could also be an injury risk to the knee and lower back. Your arms are behind the body in preparation for the landing and take-off. Your legs should flex (yield) to cushion the fall. To reach the highest point in flight after the take-off, you should have a target to aim for. Having this goal will make all the difference to the effort from the ground. You should begin performing depth jumps from a box height of 40 – 50cm and then gradually work your way up to as high as 75cm. You should also never do jumps when you are tired, sore from some other training or if you are recovering from injury. 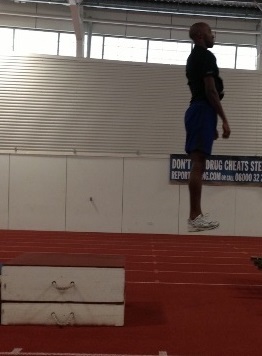 However, I am sure you will agree that plyometric boxes and the depth jump are a match made in heaven! From "Plyometric Boxes And Depth Jumps - A Match Made In Heaven" Back To "Faster, Stronger, Better – Your Shortcut To Improved Athletic Performance"